Chip Crawford is flanked by his daughters Shannon, left, and Bryce in Iceland the afternoon before an accident left Chip with severe burns on his body that caused him to receive 13 skin-graph surgeries. William (Chip) Crawford knew a trip to Iceland would be a bucket-list adventure and a life-enhancing experience. 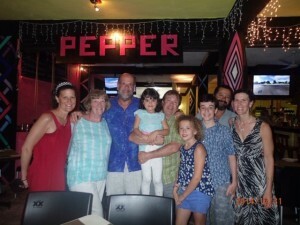 Chip’s daughters, Bryce and Shannon, planned a surprise father-daughter adventure in celebration of his 70th birthday. What he didn’t know was exactly how much it would alter his life. Chip, an elder, deacon and Stephen Minister at Fox Chapel Presbyterian Church in Pittsburgh who is also a current member of the Synod of the Trinity’s Personnel Advisory Board and has had past roles with Pittsburgh Presbytery, suffered third-degree burns over 40 percent of his body and second-degree burns over 20 percent of the skin surface when he fell into a geothermal hot spring while visiting the Nordic island. 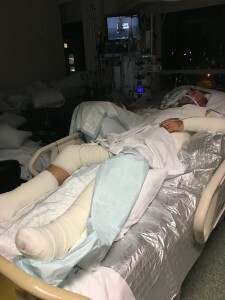 The accident resulted in an extensive rescue operation followed by a four-month stay in Pittsburgh hospitals – including a four-week period when he was in a medically-induced coma while undergoing 13 skin-graph surgeries and other related operations. “Folks in the medical community, and burn survivors, report it takes up to two years for recovery – depending on the extent and depth of tissue damage,” Chip said. “I’m now at the two-year mark and have my life back, yet the journey for full recovery continues. The first day of the trip was spent exploring the capital city of Reykjavik, and the second day consisted of some hiking, a stay in a local bed and breakfast and an evening meal there. After dinner, the three of them went to the Secret Lagoon, a nearby hot spring where they spent about 45 minutes swimming in warm water and taking in the scenery. Chip was only a few feet from the ridge when his foot slipped into a pool of hot water under the surface. Chip Crawford suffered second- and third-degree burns over 60 percent of his body after an accident in Iceland two years ago. Shannon (on a boardwalk about 15 feet away) heard her dad’s screams, making her the first on the scene along with a stranger, who was also in the area. They were able to eventually pull Chip from the water. Surprisingly, the rescuers did not suffer any burns to their bodies. Chip, who was now in the hands of his daughters, was quickly rushed to a locker room where a rescue team was summoned. He was transported to the main hospital in Reykjavik by ambulance and helicopter where he spent two nights. Knowing Chip needed special burn center care, having him flown to Sweden or England was discussed, but his daughters knew that would be problematic for the family and arranged a life flight from Reykjavik to Pittsburgh where he would be close to home and also receive the medical and socio-emotional support needed. Chip was treated in Pittsburgh’s West Penn Burn Center for a month before moving to LifeCare Hospital for four more weeks. After discharge he received three weeks of in-patient rehabilitation at Health South in Harmer, PA. This was followed by three additional months of outpatient rehabilitation. Rehab continues with daily visits to a local gym. Upon his release from the hospital, Chip continued with outpatient rehab for another couple of months. Because he was restrained, on a respirator and tube fed during much of his time in the hospitals, his body weight went from 200 pounds to 140. It took six months to regain the function of his joints, ligaments and muscles. These days, Chip is back to a more desirable weight of 180 pounds. He’s mobile and clear-headed but admits to being forgetful, which could be because of the distraction from pain and nature (aging). “My Stephen Ministry friends and so many people at the Fox Chapel Presbyterian Church and other faith communities prayed incessantly, wrote letters of concern, get-well wishes, visited with me in the hospital (even when I was out cold) and dropped by the house with baskets of food and bundles of love. Chip Crawford is once again able to spend time with his wife and family after spending months in Pittsburgh-area hospitals following an overseas accident. Chip admits he doesn’t believe in predestination; that something like this was part of God’s plan. It’s easy to wonder why bad things happen, but Chip is able to look beyond this experience to see how it will continue to inform and strengthen him. 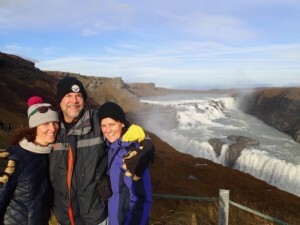 Chip would like to return to Iceland in the near future to experience the final three days of the birthday gift his daughters planned for him. This time his wife, Michel, will accompany them. He’ll go back to Reykjavik, and the Secret Lagoon where the incident happened, if for no other reason but to thank the hospital staff, the rescue teams and those from the hot spring for their amazing outreach and assistance after his accident. Note: Read a first-person account of the accident from Chip in the Iceland Monitor by clicking here.